Running a restaurant is not an easy job, and neither is finding the right theme that will present your business on the web in the right way. If you aren’t an expert, you might find it a bit complicated to create a website, to say the least. This is where great themes jump in and save the day, because all it takes is one single great restaurant WordPress theme to make your website a professional, attractive and interesting presentation of your business. ForkBite is a restaurant WordPress theme created by ChimpStudio and it is featured on ThemeForest. 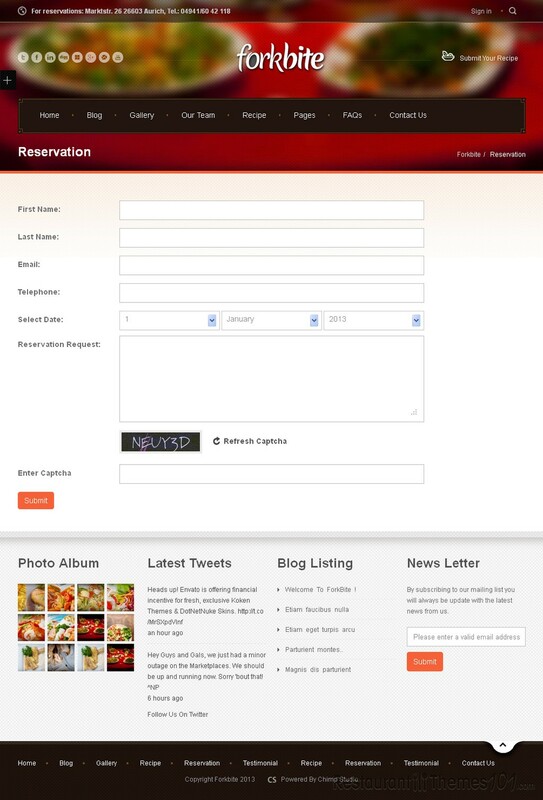 This WordPress restaurant template has a modern design and it is specially made for restaurants and food recipe websites. It is extremely easy to modify it and tweak it in many ways so you can give your website a bit of your own personal taste and touch. The documentation given with the theme is extensive and the PSD files included have been customized to allow fast skinning. The layout is responsive, which means the theme will automatically adjust to any given screen size or resolution and your website will look just as great no matter what device it is viewed from. The theme has several main features that are meant to make your website presentable in the best possible way. 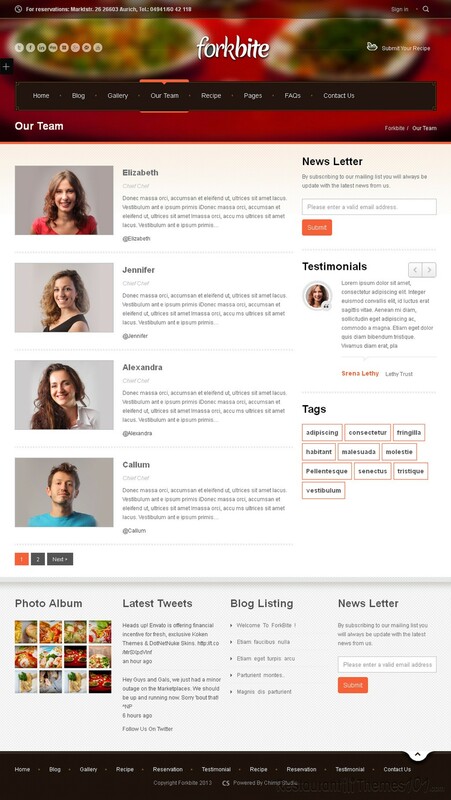 The recipe and gallery management is very easy and it will allow you to create great looking posts and pages. The theme also features a $15 worth layout slider and a slider management with which you will be able to customize it just the way you like it. ForkBite is cross browser compatible and it is very well documented so you can be sure you will find your way around with the theme easily. 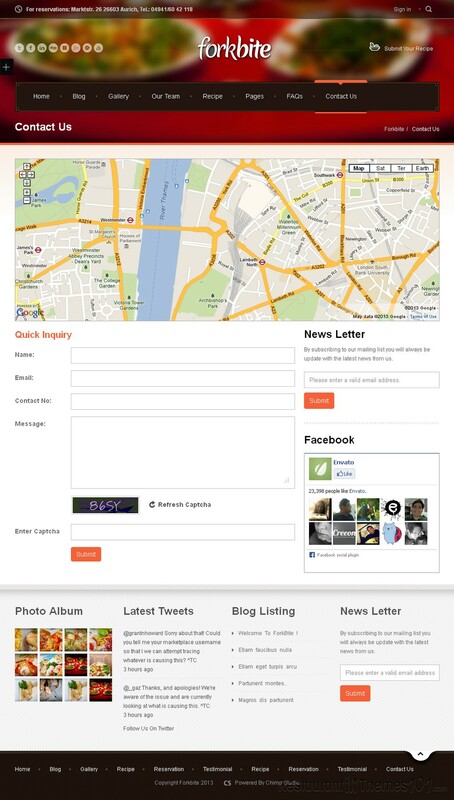 The admin panel and theme options are very powerful and they will allow you to run your website with ease. It features great social network integration and many other nice features including the possibility of publishing comments of your happy customers so any new visitors can be assured they’ve come to the right place. There is nothing better for a restaurant than nice words of praise coming from happy customers.